Posted in Stories, Three Line Tales, Uncategorized, whatever! She looked at the crowd and was frightened but knew she had to speak up against the violence and destruction all around her, she had to find the courage to fight them, not in their way but her way. There was a fire in her for love and equality that she could not deny and she knew when she spoke out against the hate and bigotry she was witnessing there would be repercussions, but she stood her ground and had her say. She had no choice but to take the flame and light the fire in others to spread the message of love and equality for everyone everywhere. A happy childhood memory of Autumn is the leaves in the yard. We did not have a lot of trees but enough that when the air was chilly the leaves would fall and cover the lawn. Daddy would rake them into a big pile in the middle of the back yard. Then the fun began. 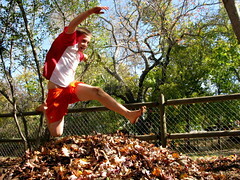 We would run and jump into the pile of leaves over and over. The leaves made a nice cushion to fall into so the landing was soft. The smell of the leaves was most wonderful. We would run and jump and laugh, just having a great time. I think because it was just once or twice a year that we did this made it special. Of course, after we had our fun, Daddy would rake the leaves into a pile again and then there would be the fire. Back then it was okay to burn the leaves, no laws against it, I guess we didn’t know about global warming and air pollution. The fire was always in the evening just before the sun went down so it was a bit dark and the air changed from chilly to cold. We would sit near the burning leaves, watching the embers glow a bright orange, smelling the pungent woodsy smoke, and feeling the warmth of the fire on our cold hands and faces. When the fire was down to just cooling ashes we would go into the house to the warmth of the kitchen and have supper and replay the fun of the day. Then we would have our baths. All the running and jumping and laughing of the day, then the hot food and warm baths, made some very sleepy heads ready for cozy beds. I miss the smell of the burning leaves. Someone should make a candle with the scent of burning leaves. It would be a best seller–at least to some of us of the boomer generation.